Ainu chiefs played an important role in their society. Each Ainu village was administered by three hereditary chiefs. Interestingly, they were not allowed to judge criminals. This function was performed by other members of the community. 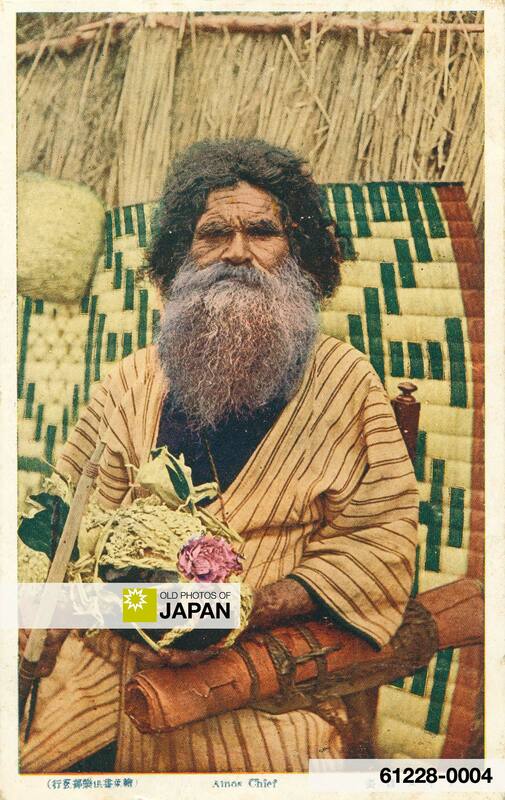 The Ainu are a distinctive ethnic group which used to have a culture completely different from that of the Japanese. This culture was virtually destroyed during the Meiji Period when policies aimed at assimilating the Ainu into Japanese culture outlawed their language and restricted their activities. The word Ainu is derived from the word Aynu, which means human. These days some Ainu prefer the term Utari. During the Edo Period they were often referred to as Ezo, Yezo or Emishi. Although the Ainu probably inhabited large areas of Japan, they are now mainly found in Hokkaido. 1 Diamond, Jared (June, 1998). Japanese Roots. Discover Magazine Vol. 19: 86-94. You can also licence this image online: 61228-0004 @ MeijiShowa.com.